Donald Trump-what do you think about when you hear that name? Is it real estate, casinos, business-man or president? It’s hard to believe that he will be president soon, but love him or hate him (because there just is no in-between for this man, it seems!) he has built a name for himself and for his future generations. 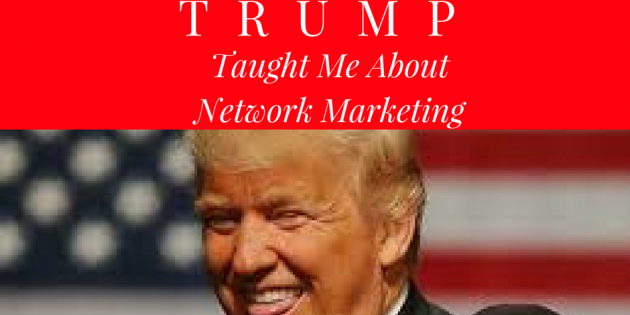 The name TRUMP is plastered across buildings around the globe, so it may be hard for you to imagine what this guy could possibly teach you about network marketing when his specialty is in real estate deals. I recently read his book Art Of The Deal and I would recommend it to anyone in business because there are quite a bit of lessons you can take away in that book. But I am going to share a few ideas that I learned that could help you in your network marketing business…. Network marketing itself can be intimidating if you’ve never done it before. Why? Because it involves talking to people and seeing if your offer is even going to fit that person. There are many ways to do this business-one on one, 2 on one’s, home meetings, online, etc. But people are usually too afraid to step out of their comfort zone and even try. So even if someone had an entrepreneurial bone in their body, it’s just easier to sit back, go to a job, and get a paycheck each month without trying to be anything greater than a wonderful employee. Therefore, next time an opportunity comes your way-just take it and see what happens, because you never know!! 98% of the population only thinks about their problems, worries and concerns instead of solutions and how they could obtain what they want in life. It probably sounds absurd that anyone could be afraid of winning or of success, but think about the goals you set. Were they small or big? Could they be bigger? My guess is most likely and I’ll give you an example…. When I first got into this business my goals were to make around $1,000 a month because that was close to my paycheck and I didn’t really imagine anything bigger than that. As time went on I wanted $100,000 per year… but why stop there? There are people in this industry who make millions in a month, so why not you? You are your own limit, so think bigger!! Now that you’ve got big goals, how are you going to obtain them? The key is total focus. If you have followed any highly successful individual you may notice a pattern. Trump calls it “Controlled neurosis” because those people become so obsessive and single-minded driven that all they think about is what they want and how to get it. Some people may call it crazy, but they channel all that desire into their work and usually the end result is what they want. Just a few examples: Katy Perry-she was dropped from 3 labels and still pushed on. Eventually she was signed with another label that started her success. Oprah Winfrey-she was hired on a local news channel, then later fired and was told she was “unfit for TV” Did that stop her? No-finally she was hired on a low-rated show and a few months later it had the highest ratings! Stephen King-He started out at 16 submitting short stories to magazines that got rejected. Then his first book Carrie was rejected 30 times before it got published! Now look at him, he’s a huge success. Henry Ford-he tried 3 companies and failed 3 times before his dream of an automobile in every home became a reality. If those people didn’t continue to chase their dreams the world as we know it could be much different. There are so many more similar stories to those mentioned above, but you have to keep pushing on and fight for what you want-and focusing on the end result is the key! This is a big one. Even if you had the greatest product ever invented, if you don’t know who to target and there is no demand for it, it will not be a hit. The trick with any business is to find out who your market is- I don’t care what you’re selling. You must know what benefits or solutions you offer and then match that with what your market wants. This process can take time but once you’ve mastered it, you honestly could sell anything. I’ve seen many people who mastered this skill and they are able to sell completely different products and make an incredible profit from everything they’re selling. It’s all about knowing your market, what they want and delivering the goods. Of course this is another big one. People need to hear about what you have, otherwise you’re not going to have any business. Do your friends and family know that you’re in marketing? Do they have any clue what products or services you have to offer? If you are anything like I was-then my guess is they don’t. I was too scared to tell anyone at first that I had gotten into one of those “pyramid deals” especially after my first run with it turned out horribly and I had been rejected so many times. Eventually I did show my family members and other friends and it turned out they actually liked what I was offering this time… So you never know! Don’t be afraid to spread the word because you don’t know who will want what you have. Trump defines this as “an innocent form of exaggeration and a very effective form of promotion.” People always want to believe in something that is the best, greatest, biggest or most (fill in the blank). If you believe your product or service is the greatest then you should be promoting it like it is! Same if you’re trying to brand yourself-promote like you’re the best to work with! Give them a reason to use your product or service or to want to work with you. If you follow Trump, then you probably already know this one. He’s got people who love him and then he’s got people that can’t stand him. If you’re building a business, it’s going to be the same for you too. You’ll have fans and followers and on the other side you’re going to have the haters and those trying to stop you from what you’re doing. And in this type of business, your “haters” could be in the disguise as your closest friends or family, telling you it’s a pyramid, it’s a scam, you’ll never achieve much or to just go get a real job. At some point you will have to ignore your haters and keep on pushing for what you want-keep chasing your dreams. Remember you can’t please everyone anyway, and that’s just life in general; therefore when you start to get “haters” about your business, that probably means you’re doing something right-so go for it! Persistence could be the difference between success and failure in your business. Ever heard the phrase “You can’t beat the guy who doesn’t give up”? Well that is true. No matter how many times you lose or fail, if you keep trying, eventually something will stick and you’ll have a breakthrough. With that I’ll also mention that some people obtain success quicker than others, so don’t compare yourself with someone else’s success. Your personal achievements will come based on your own work ethic, skills, knowledge, and of course, persistence. Building a business is never easy. It doesn’t matter if it’s a traditional business, E-Commerce, network or affiliate marketing business. Was this helpful? Please like, comment and share on social media!! P.S. Want more help in building your network marketing business? Click here to get a F.REE 7 step guide! You’re welcome Christine. Yes, if you don’t try-then you won’t know. I agree with you to just keep going forward.